How Did Dinosaurs Turn Into Birds? Imagine a Tyrannosaurus rex next to a sparrow. The dinosaur is 12 meters tall and has a snout with pointed teeth. The bird is small and delicate, with a long, thin beak and wings. Although they look nothing alike, the T. rex and sparrow belong to the same family tree. That’s because, as scientists have only agreed upon in the last few decades, birds are the descendants of dinosaurs. Specifically, birds evolved from a group of dinosaurs called theropods, which included carnivorous beasts like the T. Rex and Velociraptor. Theropods walked on two feet and had short forelimbs. They lived in the late Triassic Period, before the first birds appeared around 150 million years ago. The question of how theropods turned into birds puzzled scientists for decades, and still continues to be debated. Why did a monstrous T. rex shrink over time into a tiny bird? How did short forelimbs develop into a broad wingspan? What were the steps that lead from a fearsome snout into a toothless beak? One thing is for sure: theropods did not turn into birds overnight. Since the mechanisms of evolution do not provide an instant makeover, it took many generations for traits like wings, feathers, and beaks to evolve. In order to figure out how a bird emerged from a line of dinosaurs, scientists hunt for fossils of creatures that lived in the transitional period between them. Evolution is like a video, a continuous progression that gradually leads one type of organism to another. Fossilized remains are like still snapshots taken from the video. Using various dating techniques, scientists are able to put a series of these snapshots in order. The fossils therefore provide an outline of the stages through which these animals proceeded as they became less like dinosaurs and more like birds. The first fossil that clued scientists into the idea that birds might be modern dinosaurs is called Arcaheopteryx. It’s a strange creature, sort of half dinosaur, half bird. Like a bird, Archaeopteryx was only about 0.5 meters long, and had broad wings with feathers that allowed it to fly. But like theropods, it had sharp teeth, a long tail, and three fingers with claws. Because Archaeopteryx shares some features with dinosaurs and others with birds, it is a crucial link between the two. It showed scientists that dinosaurs and birds were connected evolutionarily. 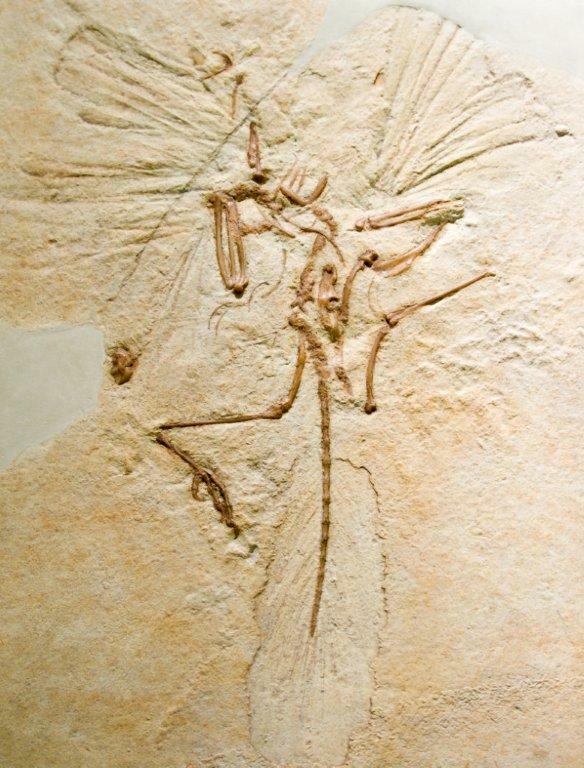 Since the first Arcaheopteryx fossil was discovered in the 1860s, much more evidence has come to light to explain the transition. 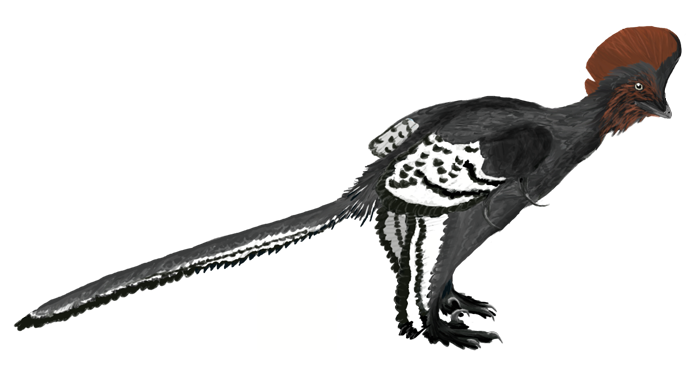 Many other fossils have been discovered, like Deinonychus, a bird-like dinosaur that was probably covered in feathers, and Anchiornis huxleyi, which was a small, feathered dinosaur that looked almost exactly like a modern bird. From these fossils and other kinds of analysis, scientists have been able to determine in which order many bird features developed in dinosaurs. We know now that dinosaurs first developed the ability to walk on two feet. Then they acquired feathers – just soft, downy feathers like those on a baby chick. Next in evolutionary history, two clavicles fused to form what we call the wishbone in birds. This alteration probably occurred to make the skeleton more durable. Next, more complex feathers – the ones used in quill pens, with stiff vanes and a pointed tip – developed. The ability to fly came after. Other features that arose in dinosaurs before the advent of modern birds include air-filled bones, which make them lighter and better able to fly, and birds’ unusual respiration system, which allows them to obtain oxygen more efficiently. The sequence of evolved traits tells us not just about what evolved when, but why these changes took place. Whereas previously some scientists had thought that feathers evolved for use in flight, the discovery that dinosaurs first evolved fluffy feathers disproves this hypothesis. It has become clear that feathers first evolved not for flight, but for thermoregulation and communication: the downiness helped bird-like dinosaurs control their own internal temperatures, and the development of color patterns helped them to communicate. Furthermore, the sequence of evolved traits suggests an overall pattern of evolution from birds to dinosaurs. What scientists suspect now is that birds are not just modern versions of dinosaurs, but modern versions of baby dinosaurs. The idea is that birds might actually have evolved by stopping development early in life. Instead of growing to a large size, adult birds stayed the size of dinosaur babies, a crucial innovation that made them compact and light enough to fly. Instead of developing bulky snouts, birds retained smaller mouthparts, which led eventually to a beak and therefore a whole array of new ecological possibility. Although we know a lot about bird evolution now, scientists are still continuing to analyze fossils, construct models, and publish hypotheses about how individual features of birds might have arisen from dinosaurs. Like many in science, the topic is ripe for new discovery.